Coconut oil is known throughout the world, not only as an extremely versatile edible oil, but also as a great natural way to deliver moisture to our skin. This natural saturated fat can be used in the treatment of a huge range of common health conditions and ailments. Coconut oil contains a substance known as lactic acid; one of the 'hydroxy acids' that can commonly be found in over the counter skin cosmetics. These compounds act as exfoliants on the skin helping to break apart and remove dry, dead skin cells. How Does Coconut Oil Help Our Skin? 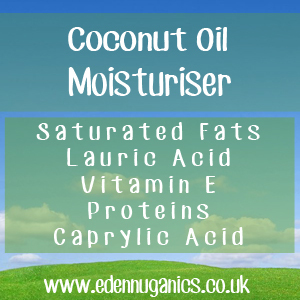 Saturated Fats: The medium chain fatty acids found in coconut oil help to keep our skin smooth and supple to the touch. When included in our diet, coconut oil helps us to maintain an even skin tone and helps to reduce the appearance of the pores. Capric / Caprylic / Lauric acid: Similar in many ways to the medium chain fatty acids, these three naturally occurring acids are what give coconut oil its unique antibacterial, antiviral and antifungal properties. Antioxidants: Coconut Oil helps to keep our skin smooth and protect against free radicals (causing premature ageing) due to its powerful antioxidant action. Proteins: Coconut oil is a great source of protein. Our bodies use this to help repair tissue at a cellular level. In addition, they help to regulate a wide range of essential functions within the body. Scoop around 2 cups of coconut oil into mixing bowl. The next stage, using a hand blender whisk the oil for around 5 minutes. By this point all of the coconut oil should be soft and fluffy. If you want to add essential oils, this is the best point to do so. Scoop coconut oil moisturiser into a storage container. That's it, simple, fast, effective and best of all coconut oil is not overtly affected by oxidation so it doesn't spoil for years! Many people make the mistake of using too much coconut oil. As it turns into a liquid on contact with the warmth of the body, a little goes a longer way than conventional creams. Plus our skin is only able to absorb a certain amount, so if you find that your daily routine is making you look like an oily mess simply reduce the amount you use for a more natural, healthy look.